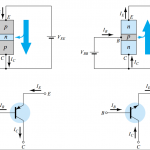 Now in this article, we see common base configuration of transistor, equations for common base transistor and input and output characteristics of a common base transistor. In previous we see the different connection of the transistor. The transistor can be connected in a circuit with three basic connection. As we know transistor can be connected in a circuit in a different way as per their requirement. Each transistor circuit configuration has some advantages and disadvantages. But in every configuration emitter base junction is in forward bias and base collector junction is in reverse bias. In this circuit connection, the input voltage is applied between the emitter and base terminal. An output is taken between base and collector. Here base is common in both input and output circuit of the transistor. Hence it names common base configuration. Fig 1 shows npn transistor whereas Fig 2 shows pnp transistor. The complete behavior of transistor can only be described by their characteristics. These characteristics are a graphical representation of transistor behavior. We can easily understand what happens with transistor when a voltage is applied across that transistor by their characteristics. Here we take input characteristics of common base configuration and output characteristics of common base configuration of transistor. Input characteristics is a curve of emitter base voltage( Veb ) with respect to emitter current( Ie ) at constant base collector voltage( Vbc ). Emitter base voltage is shown in X axis of characteristics. Emitter current is shown on the y axis. This figure shows the input characteristics of common base configuration. You can see that the Emitter current ( Ie ) increases rapidly with the small increase in emitter base voltages ( Veb ). That means input resistance is very small. 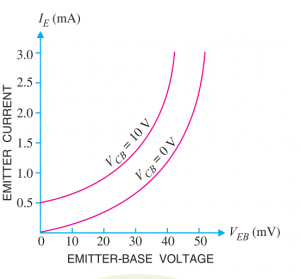 With the all collector-base voltage( Vbc ) shape of graph remain same that means emitter current is totally independent of base-collector( Vbc ) voltage. This leads to the conclusion that the emitter current is independent of collector voltage. The input resistance of the transistor is the ratio of change in emitter-base voltage (Veb ) to change in emitter current ( Ie). Output characteristics is a graphical representation of transistor output. 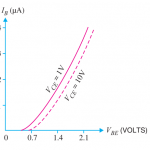 Output characteristics is curve between collector current (Ic ) and collector base voltage ( Vcb ) at constant emitter current (Ie ). Here collector current is shown on y-axis and collector base voltage is shown on the x-axis. Characteristics of the common base transistor shown below. 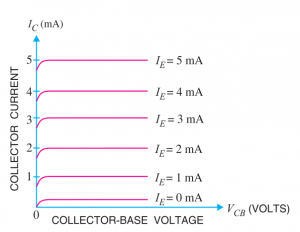 collector current( Ic ) varies with Vcb only on the starting or when the collector base voltage (Vcb) is below 1v. Transistor never operated below this voltage. After voltage (Vcb) increase above 1-2 V, you can see collector current (Ic ) becomes a straight horizontal line. That mean collector current becomes constant above 1-2 V. It means collector current is independent of collector base voltages and depends upon the emitter current only. This proves that the emitter current almost flows to collector current. The transistor is always operated on this region. the large change in collector base voltage there is a small change in collector current. That means output resistance of the circuit is very high. Output resistance is a ratio of change in collector base voltage ( Vcb ) to change in collector current ( Ic ). Output resistance is very high in terms of Megaohms. This is because of collector current not change with the collector-base voltage. Here we see equations for current amplification factor and expression for emitter current. The current amplification factor is the ratio of change in output current to change in input current. For common base configuration transistor connection output current is collector current ( Ic) and input current is emitter current( Ie). So that, For common base transistor current amplification factor is the ratio of change in collector current (Ic ) to emitter current ( Ie ). The current amplification factor is always less than 1. The practical value of the current amplification factor is between 0.09 to 0.99. Equation 1 and 2 are useful for find collector current ( Ic ). By this equations, it will clear that you can control collector current( Ic) by base current(Ib) and emitter current(Ie). The clear concept of Icbo shows in the fig. In common base connections, the current amplification factor is 0.9. If the emitter current is 1 mA than find collector current ( Ic) and base current (Ib ). So that basse current is 0.1 mA and collector current is 0.9 mA. In common base configuration collector current ( Ic )= 0.85 and base current(Ib) is 0.05 . So,find current amplification factor (α) ? In common base configuration, α is 0.95. The voltage across 2kΩ resistance which is connected in the collector is 2V. Find the base current (Ib)?